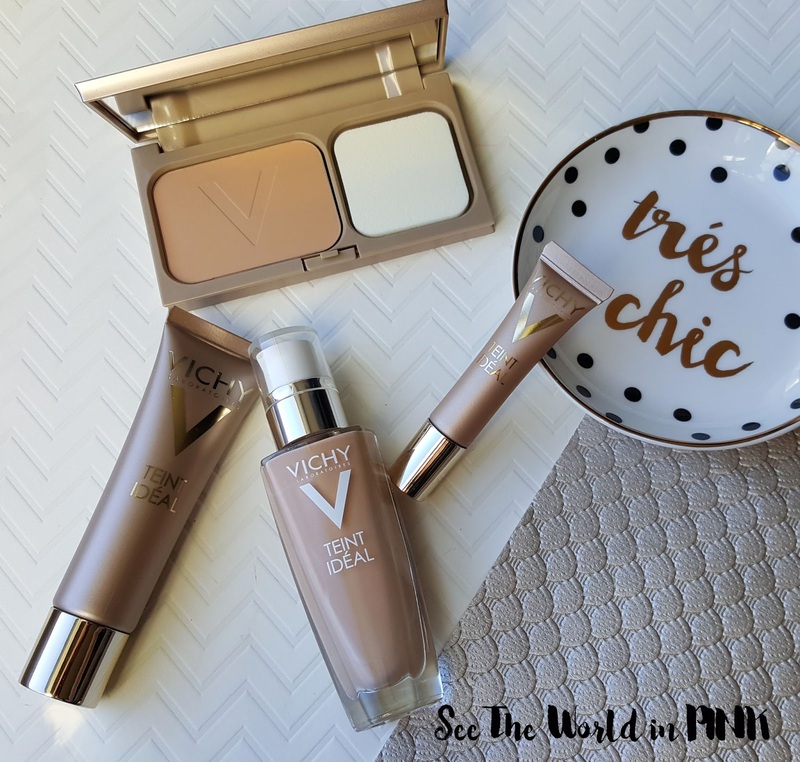 I have been a big fan of Vichy skincare for quite a long time - I was excited to see Vichy starting a makeup line! The idea of a skincare company creating a makeup line really makes me think that they will be moisturizing and good for the skin! The new Teint Ideal range includes Foundation, BB Cream, Highlighter, Concealer, and Bronzer. I am testing out the Teint Ideal Compact Powder, Teint Ideal Cream Foundation, Teint Ideal Fluid Foundation, and Teint Ideal Roll-on Highlighter! 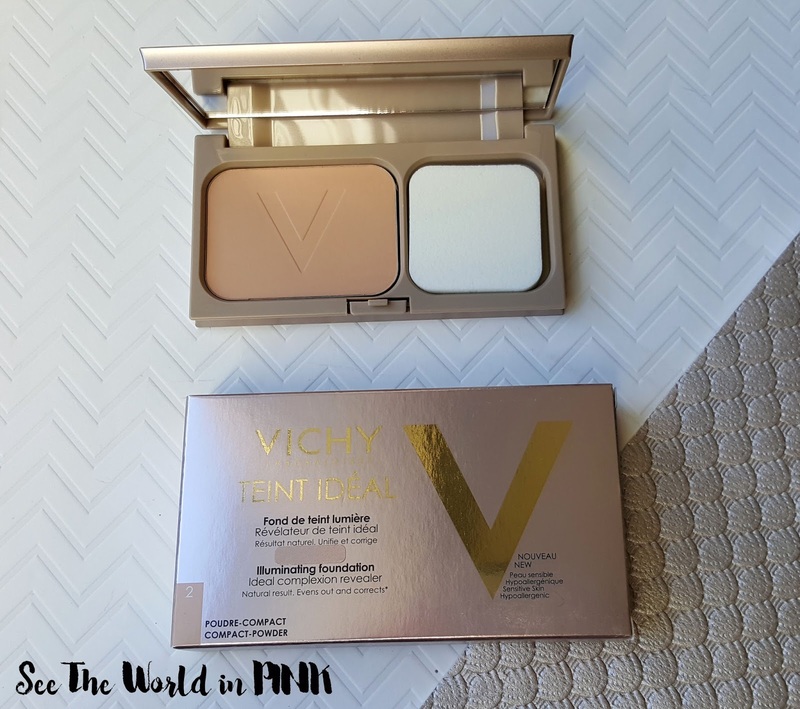 Vichy Teint Ideal Compact Powder ~ $36.00. With its light and velvety powdered texture, this formula unifies skin tone without overweighting it. This compact powder offers light to medium coverage and a semi matte finish. This is a powder foundation with a velvet-like finish that is said to be a light-weight formula. The shade I selected is #2 medium - it is a touch dark for my skintone. I generally stick to liquid foundations as my skin tends to be on the drier side. I did actually like the formula of this and thought it felt very smooth for a powder - I have rave reviews for another blogger on this product! This does only come in 3 shades, so hopefully they come out with more shades in this line for everyone! 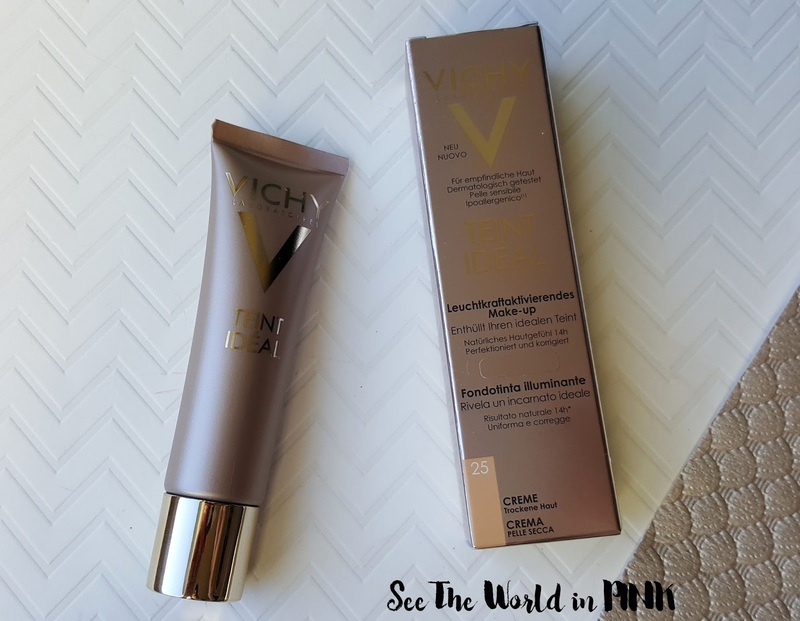 Vichy Teint Ideal Cream Foundation ~ $38.00. For the comfort of dry skin, this formula contains hyaluronic acid for 24h continuous hydration and offers light to medium coverage and a velvety skin finish. I love that this specific foundation is made for dry skin - just what I need! I love this formula - it offers a lighter coverage than the average foundation I go for, but that makes it great for days when my skin is good! At the time of testing, my skin wasn't great so this didn't offer all the coverage I needed, but it was a great formula and felt great on my skin! I think this will be a go to when I have no blemishes and am just looking for a smooth finish! 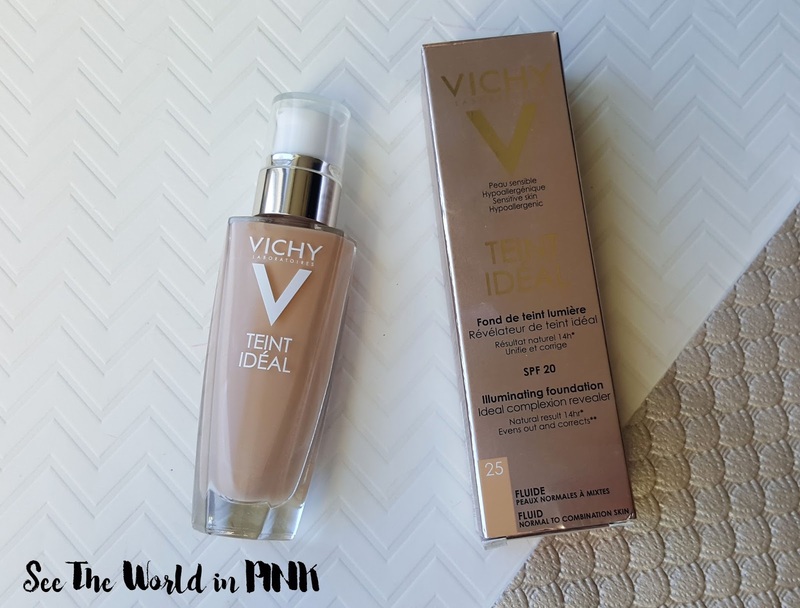 Vichy Teint Ideal Fluid Foundation ~ $38.00. Formulated for normal to combination skin, this fluid foundation fuses with the skin thanks to its ultra-liquid water-based texture and offers light to medium coverage and a luminous satin finish. This is my favourite foundation of the 3 - I was really impressed with the coverage it provided! I was also really surprised by the coverage because the foundation is incredibly thin and very lightweight on the skin! It lasted all day and didn't budge - I love this! Both the cream and fluid foundations come in 5 shades - I do hope this line continues to expand their shade range so more people can try these foundations! 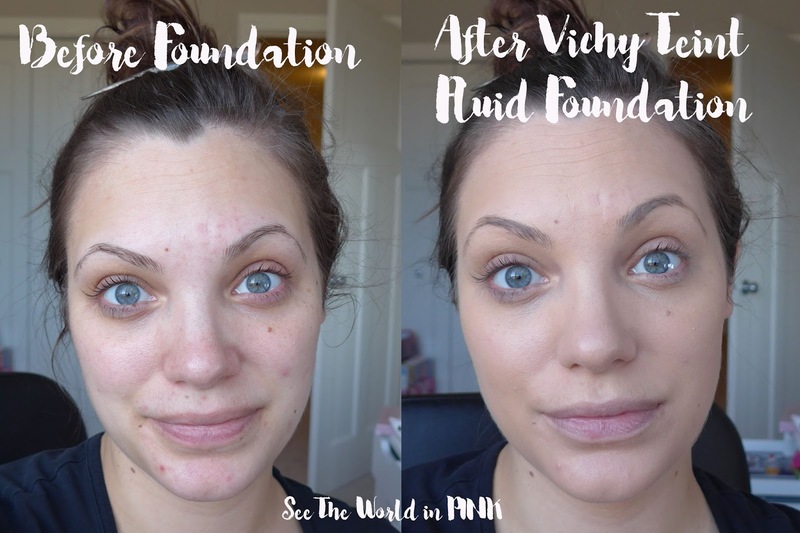 Here is a look at the 3 foundations swatched on my skin - the compact powder, fluid foundation, and cream foundation! I used 2 pumps and a buffer brush to cover my whole face - as you can see this foundation entirely covers all my red marks and blemishes and smooths my whole skintone! I really love this! 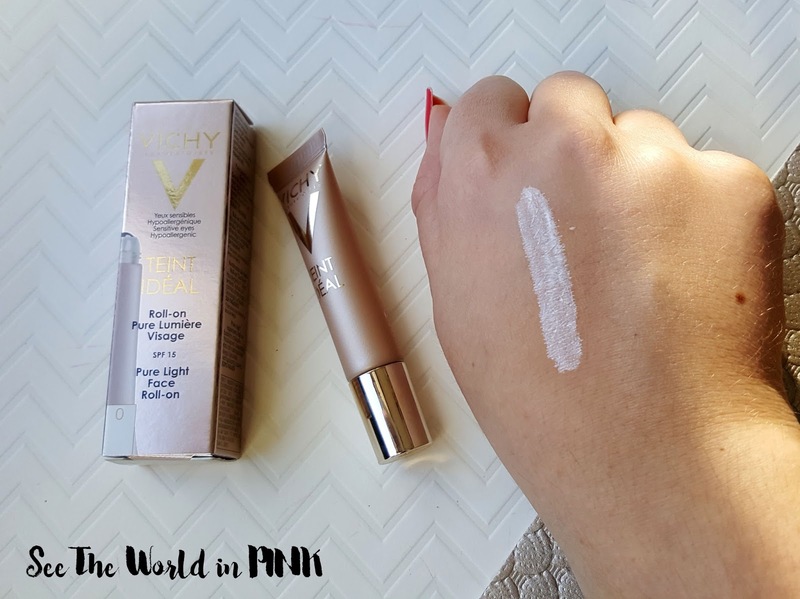 Vichy Teint Ideal Highlighter ~ $27.00. This highlighter acts like a beam of light which tosses a radiant shine over dull parts of the face. It is applied to areas most exposed to light to boost their capacity to reflect light for an instant healthy glow. Here is a look at the highlighter first applied and beside it rubbed in - it offers a nice sheen and can be applied anywhere on the skin. I like that this offers a buildable glow and can be layered with other products too! I am really happy with the products that I have tried from the Teint Ideal makeup line! Have you tried any of these products yet? 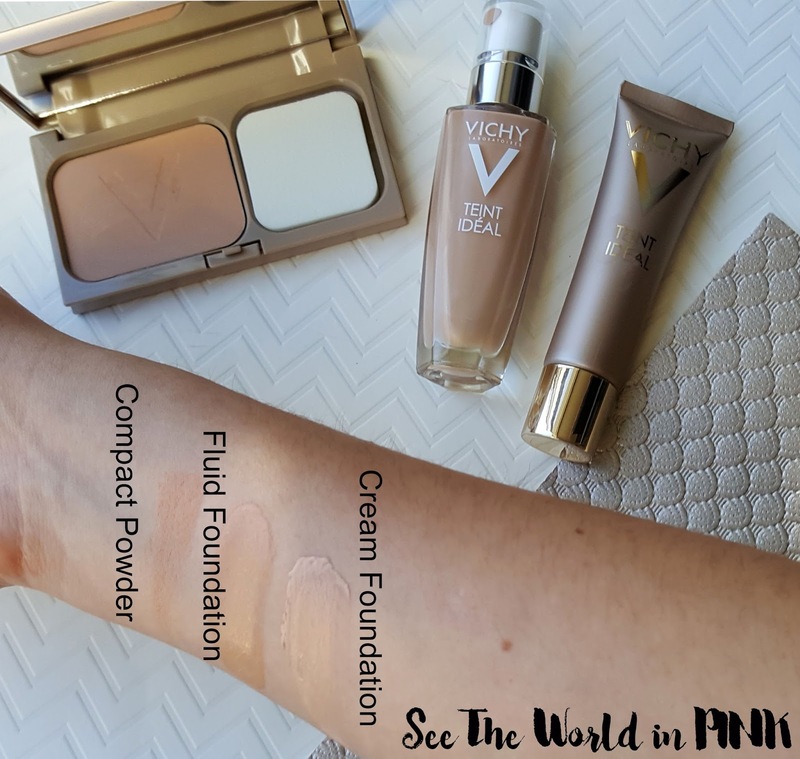 I've never tried anything from Vichy but that foundation looks really nice on you! Thanks Janine! I have been so impressed by most products by them! Really happy with the skincare line!